Bring out your dramatic side with fabulous purple nails. From OPI best selling deep, vampy shades like Lincoln Park After Dark and Black Cherry Chutney to rich, creamy eggplants like Vant to Bite My Neck, OPI has a the perfect purple for you. Please Note: We can only ship aerosols, nail polishes, perfumes, fragrances, diffusers or flammables to the UK - Oils, creams, lotions, cleansers, scrubs are OK to ship everywhere. A cutting edge purple nail polish to leave your nails looking sharp, In Infinite Shine. Please note - cannot be exchanged, returned or sold outside the UK. A cutting edge purple nail polish to leave your nails looking sharp. A dark, creamy mauve with a subtle hint of shimmer and muted berry tones. A stunning purple loaded with blue and purple shimmer for a magical nail polish perfect from fingers and toes, totally mysterious. A fabulous, hot pink with an explosion of purple. Deliciously dark black-red enriched with a soft undertone of sparkly gold. 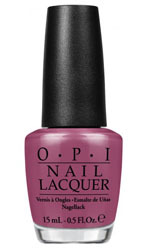 Opi Do You Have This Colour In Stock-Holm? Stock Up! 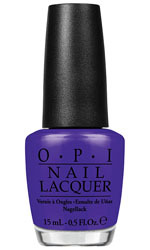 This Icy blue-violet is in hot demand! Flashy pink purple that loves paparazzi. A Kowloon-lit, moonlit violet enriched with a soft undertone of sparkly gold or silver. This racy red violet could be your vice. The paradise perfection of this lovely lavender has island birds all a chatter. More than 7 but who is counting with this mauve alous new shade. Ooh, ooh, ooh. This hot magenta offers plenty of cool shade. Pause, take a deep breath and smell the flowers. Me llama OPI! Cover your nails with this boastful burgundy. A light purple shade with attitude. Follow the piper to abundant fields of lilac. Ready for a love affair with this alluring lavender.